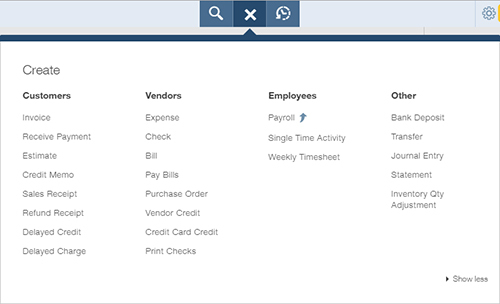 In QuickBooks Online (QBO), at the top of the window, tools are available to help you find your way. You can search for or create transactions, view recent transactions, or perform other actions not related to transactions. If you’re working in QBOA and you open a QBO company, the tools vary somewhat. The tools on this cheat sheet are for a client working in a QBO company. 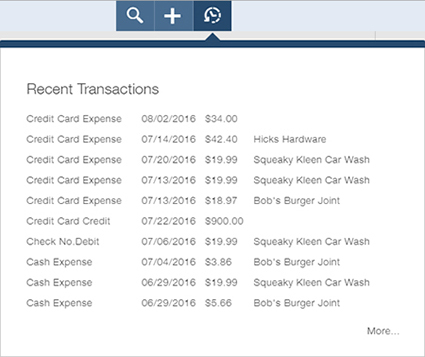 Click the magnifying glass to search for transactions. Type any identifying information or click Advanced Search to specify more detailed search criteria. Click the plus sign (+), which then changes to an X, to open the Create menu and select a transaction to create. Click the clock icon to display a list of recent transactions; you can click any transaction to open it in its transaction window. Click the Gear button beside your company’s name to display the Gear menu, which helps you perform a variety of tasks in QBO other than entering transactions.